Eagle Park gates are closed after dark. Yes: Eagle Trail Map (4.5mb, Office for Recreation and Sport link), Eagle Trail Map (4.5Mb local link). Yes: Eagle Mountain Bike Park care of Office for Recreation and Sport. There are map boards just inside the top and bottom entrances to the park. The trails and junctions are signposted. Drinking Water: Yes, there is a water tank in the park, refer to trail map for it’s location. There’s no mains water in the park. Toilet facilities: No. The nearest public toilet is in the township of Crafers. Car Parking: Yes, there is a car park at the bottom entrance off Mt Barker Rd (Pastor Kavell lookout). When entering via the top entrance (ie Crafers side) please don’t park on Hawk Hill Rd as one of the residents has 2 trucks, parking on this road will block truck access. Please park on Hillcrest Ave.
Eagle Mountain Bike Park is located 12 km south east of Adelaide city center. The main entrance is via the car park of Mt Barker Rd. The park can also be accessed via the top entrance near Crafers, please note the parking restrictions when entering via the top entrance. 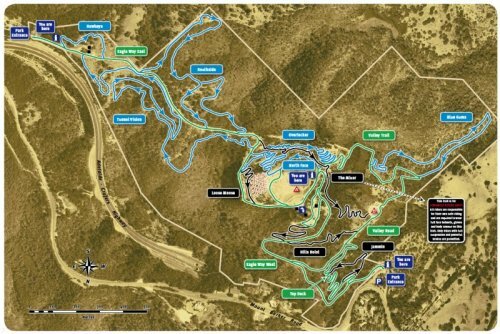 There is no public transport to Eagle Mountain Bike Park however there is a paved bike path from the bottom of the South Eastern Freeway to Crafers that passes the main entrance of the park. There are regular volunteer trail care days to maintain the trails in the park. For further details contact the South Australian Mountain Biking Association. There are regular volunteer bush care days to promote native vegetation in the park. For further details and contacts refer Eagle Mountain Bike Park or contact the South Australian Mountain Biking Association. Eagle Mountain Bike Park is in the Mt Lofty Ranges Fire ban district. The park is closed on days of declared Total Fire Ban for the Mount Lofty Ranges fire district. Refer the CFS web site for Total Fire Ban declarations. Here is a great Photo summary of Eagle MTB Park. Here’s a great article on the Eagle MTB Park trails by Jase at Ride More Bikes.